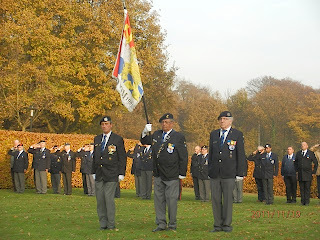 On the 19th November 2011 I was in the Netherlands to attend a reunion of Unie Van Nederlandse Veteranen-Koude Oorlog Veteranen en Oud Militairen (Union of Dutch Veterans-Cold War and other Military Veterans) known as UNV-KOVOM to commemorate the end of the Cold War in November 1991. 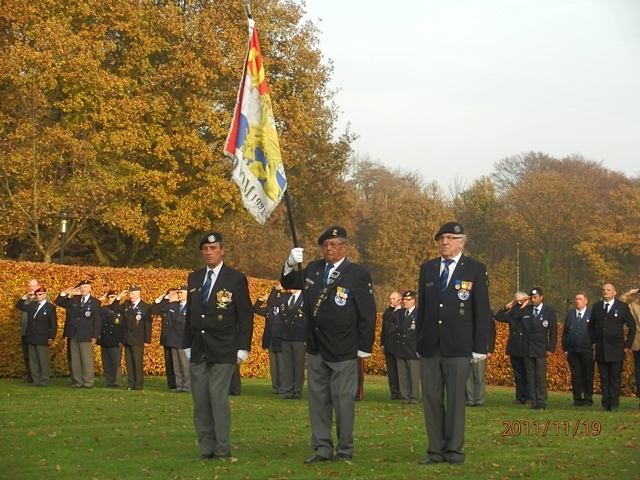 I have the honour and privilege of being the only none Dutch member of the organisation. 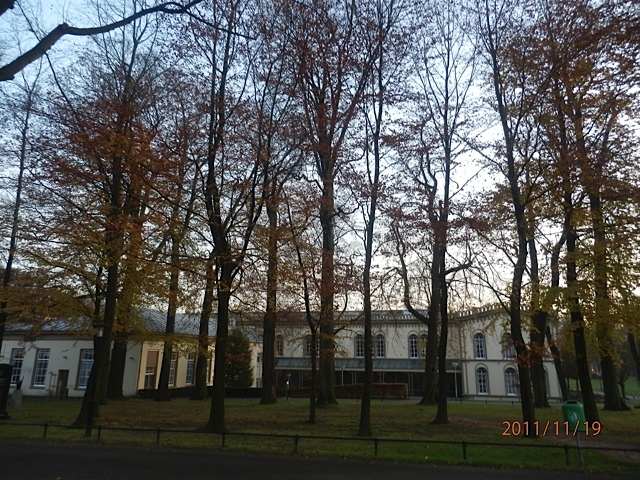 The gathering was held at Bronbeek which is to the Dutch what the Royal Hospital, Chelsea is to the British. 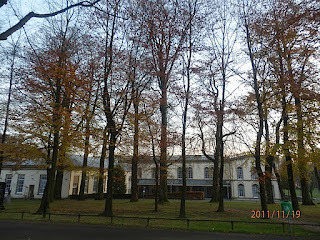 The House stands in a beautiful setting on the outskirts of Arnhem. On the 20th my good friends Rob Vaneker and his wife Nelly helped me make a Harden pilgrimage. Lcpl Harden was the last member of my Corps, the Royal Army Medical Corps, to be awarded the highest British award for valour, the Victoria Cross. 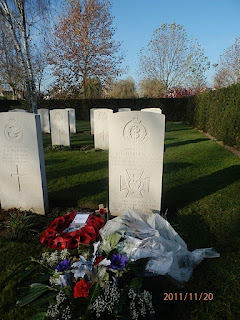 The first port of call was the Commonwealth War Graves Commission cemetery at Nederweert. 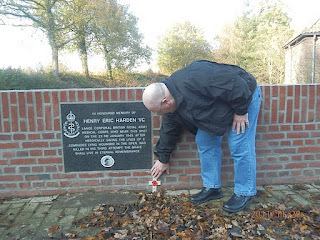 There we found the last resting place of Eric Harden and I was able to place a small wooden cross on the grave as a mark of admiration and remembrance. 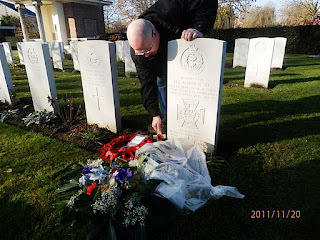 Having paid my respects to Harden VC there was time to look at the rest of the cemetery before signing the visitors’ book and moving on. I have friends in Limburg Province and when I next visit them I shall make the pilgrimage again. Then we moved on to the bridge at Brachterbeek where Harden lost his life. 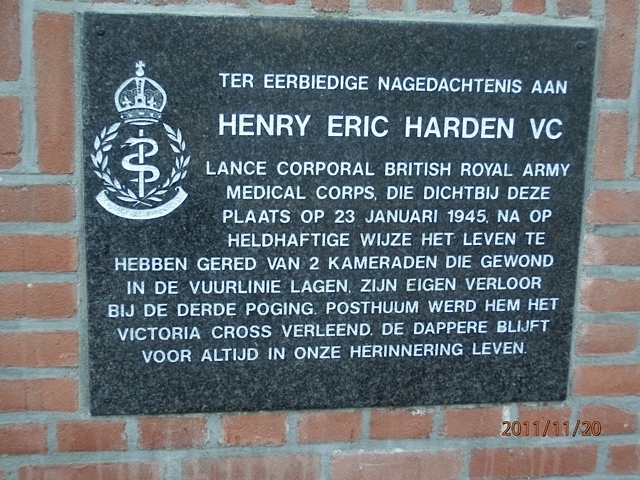 There are two commemorative plaques, one on either side of the road, one in Dutch and one in English. These are not the original plaques. 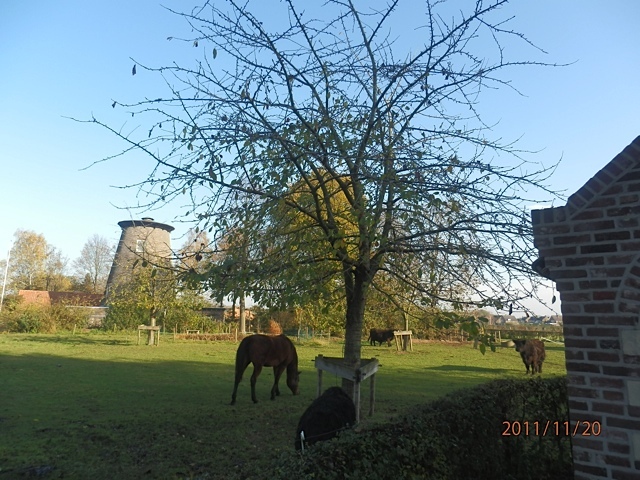 I am given to understand that they were bronze and were stolen for their scrap value. These new ones are marble and sealed firmly into the wall. 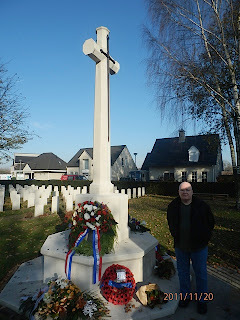 Again I was able to place another small cross beside the plaque. 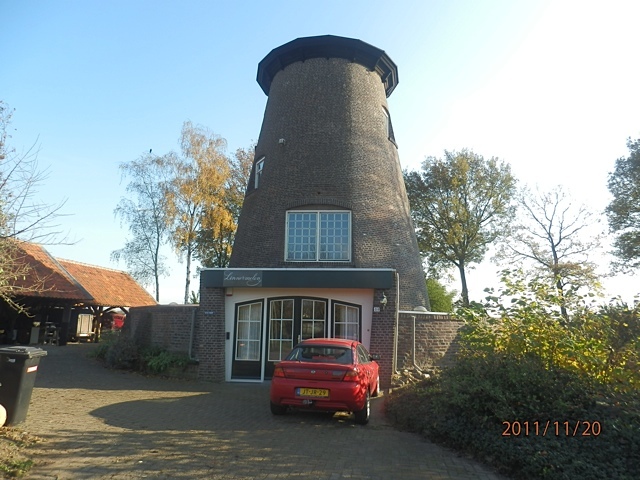 Whilst the house that was used as the aid post is no longer there the mill where the German machine gunners and snipers were situated has now been converted into a private dwelling. What surprised me more than anything else was how close the bridge is to the mill. Anyone one that bridge could have had very little chance of survival; which makes Harden’s actions that day even more astounding. Here is a web address that will take you to a video of the re-consecration ceremony. When I joined the RAMC, way back in the early sixties, one of the first things I was told was the tale of the heroism of Eric Harden which we held in even more esteem than the double VCs of Arthur Martin-Leake and Noel Chavasse. 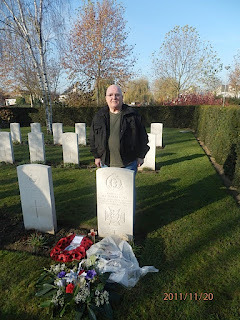 For those that do not know it here is the story of that immensely brave man. 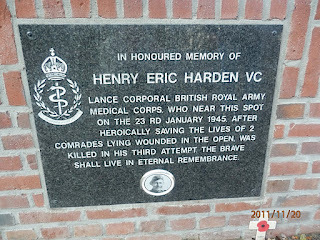 Henry Eric Harden VC (23 February 1912 – 23 January 1945) was an English recipient of the Victoria Cross, the highest and most prestigious award for gallantry in the face of the enemy that can be awarded to British and Commonwealth forces. 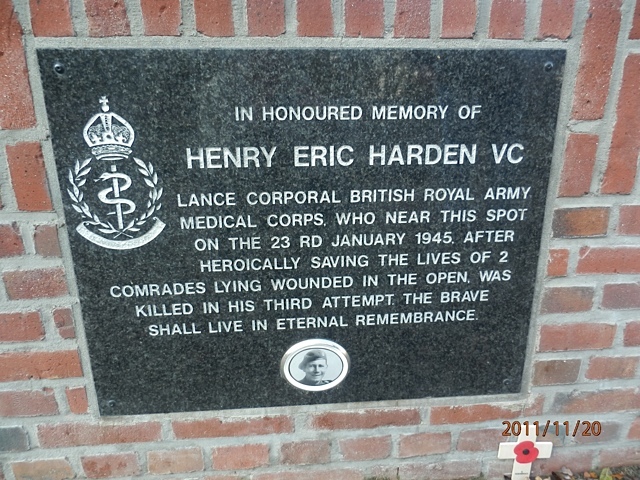 Harden was a 32 year old, lance-corporal in the Royal Army Medical Corps attached No. 45 (Royal Marine) Commando during the Second World War when the following deed took place for which he was awarded the Victoria Cross. 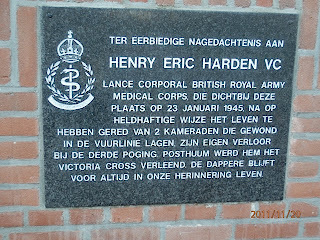 On 23 January 1945 during Operation Blackcock, at Brachterbeek, Netherlands, three marines of the leading section of the Royal Marine Commando Troop to which Lance-Corporal Harden was attached fell, wounded. The Commando section had come under heavy machine-gun fire in the open field that morning, and the men were seriously wounded. One of the casualties was Lieutenant Corey. Under intense mortar and machine-gun fire Harden was wounded in his side as he carried one man back to the aid post, which had been set up in one of the houses along the Stationsweg in Brachterbeek. Against the orders of another Medical officer he then he returned with a stretcher party for the other two wounded. Bringing in the second casualty the rescue party came under enemy fire which killed the wounded Commando. While finally bringing back the third man Lieutenant Corey, who had demanded he be recovered last, Harden was shot through the head and killed instantly. 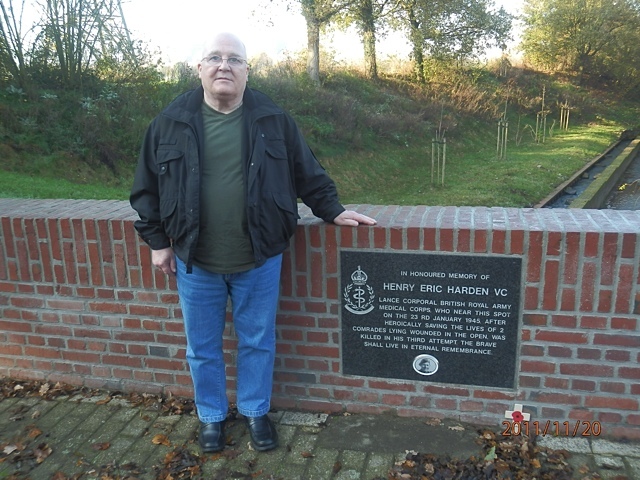 Henry Eric Harden was then 32 years old, married and father of a son and daughter. 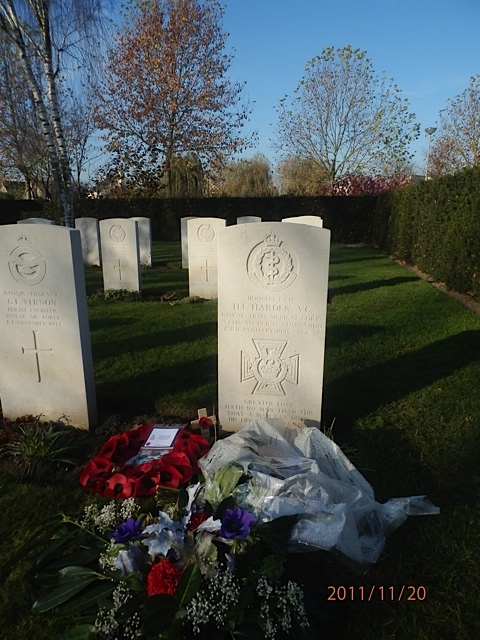 He was posthumously awarded the Victoria Cross for his fearless action. 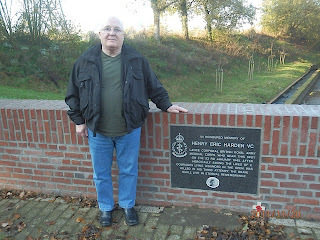 On the bridge near the mill there is a plaque to commemorate Lance Corporal Harden. Lance-Corporal Harden's final resting place is in the Commonwealth War Graves Commission cemetery at Nederweert, Limburg, Netherlands.